Explore the most popular sections of the Abel Tasman Coastal Track with this Three Day Guided Walk. Stay aboard the unique Aquapackers at Anchorage – and at the elegant Awaroa Lodge with a rest day to relax or experience a fantastic sea kayak tour. Explore the lesser known parts of Abel Tasman National Park and complete the entire Abel Tasman Coastal Track with accommodation at the unique Aquapackers, elegant Awaroa Lodge and luxurious Ratanui Lodge on this 4 day Guided Walk. 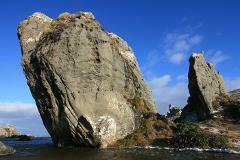 The Heaphy Track is New Zealand’s most diverse and longest Great Walk. Experience a well-formed trail through an ever changing landscape of tussock lands and lush forests to the wild yet beautiful West Coast. If you don’t have the time to complete the entire Milford Track, a One Guided Day Walk will give a great overview of this popular trail. 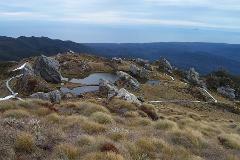 This affordable and comfortable, fully-guided walk samples the picturesque Kepler Track. 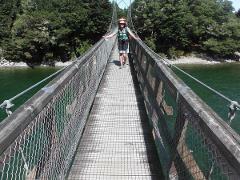 An easy and leisurely stroll on a well graded path takes you around the South end of beautiful Lake Te Anau. 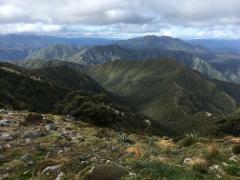 Enjoy the breathtaking scenery, learn about the unique flora, fauna and history of the area and leave the organising to us on this popular one day guided walk on the Routeburn Track. 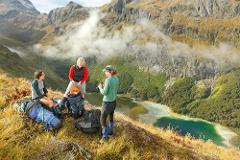 The three day guided walk on the Hollyford Track is an all-inclusive wilderness experience with expert guides in a journey of discovery from the mountains to the sea. If it is a fully guided experience with all meals, accommodation prior to the walk, transport to and from the trail and even the ease of a helicopter ride to cover some of the distance on the first day, then this three day walk is for you. 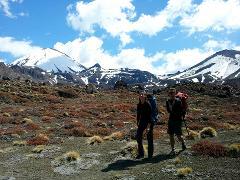 This one day guided walk of the Tongariro Alpine Crossing is the easiest, most convenient and truly rewarding way to experience one of the world's top hikes. 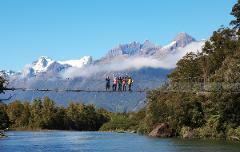 This 4 day guided walking package is pure luxury! After an exhilarating walk each day, at night we come to rest at an upmarket accommodation place complete with gourmet restaurant, fine wines and a superb setting. This 5 day guided walking package is pure luxury! After an exhilarating walk each day, at night we come to rest at an upmarket accommodation place complete with gourmet restaurant, fine wines and a superb setting. 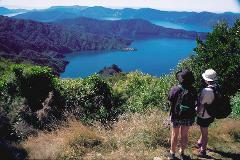 If you are just passing through Picton, this trip provides an excellent day excursion into the Marlborough Sounds. Your guide will attend to every need as well as provide full interpretation on the area, this is the perfect day trip! 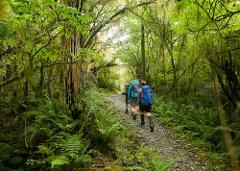 Join us for a modern day journey in Cook's footsteps along the 70km Queen Charlotte Track. Explore this vast network of drowned river valleys from the unique perspective of this well-formed track and then from the seat of a sea kayak. 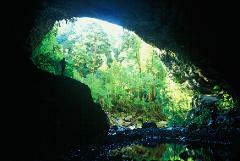 Explore the beauty of New Zealand, with a multi day package, customized to your specific requirements. In the North West corner of the South Island of New Zealand a ghost has awakened. A long-forgotten gold miners’ road has been revived! Our Deluxe Guided package combines the best lodge and luxury hotel-style accommodation available.